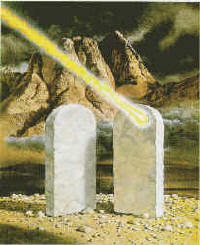 The first book of the Old Testament is Genesis, often subtitled “The First Book of Moses.” Tradition says it was written by Moses, though the book itself does not identify its author.” Genesis” means “beginning,” which is appropriate, since this book contains a simple but profound story of the creation of the world. This is not intended to be a scientific explanation. The Bible tells us that God did it, but not how. The Bible makes an important distinction between humans and other living creatures. The animals were made after their kind (Genesis 1:25), but humans were made in the likeness and image of God (verse 26). Genesis tells us that God established an environment for Adam and Eve in the Garden of Eden and gave them a choice, symbolized by two trees (Genesis 2:17). Eve decided to eat of the fruit of the forbidden tree after she listened to the serpent (identified in the New Testament as Satan, the devil), and Adam made the same decision. Their act led to banishment from the garden, leaving them to make their own way in the world, where they and their descendants eventually surely died, just as God had said. Adam and Eve were typical of us all. At this early time, and in this simple setting, they showed that humans, if allowed to choose whether to trust and obey God, could choose to take matters into their own hands. Their decision set the course for the grim trail of war, hatred and strife that has marked human history. We got off to a bad start in the Garden of Eden. Yet by the time we reach the last chapters of the Bible’s last book, we will see that in spite of our grim past and uncertain present, we humans face a positive future. God has a plan to save humans, and the Bible tells us about that plan. It is, above all, a story of hope! But we are getting ahead of ourselves. Let’s continue in Genesis. The human race became increasingly violent and corrupt over the next few hundred years. Eventually God intervened. God told Noah to build an ark in which Noah, his immediate family and two of each kind of animal could be protected, while other life perished in a great flood. After this flood, it wasn’t long before Noah’s descendants rebelled again. God again thwarted man’s rebellion by confusing his language, making it necessary for tribes to disperse. The history of Israel begins with Abraham. God ordered Abraham to leave his homeland (in modern-day Iraq) and to journey towards a distant promised land that eventually would be given to him and his descendants as an inheritance. God further promised Abraham that if he remained faithful, all the people of the earth would be blessed through him. 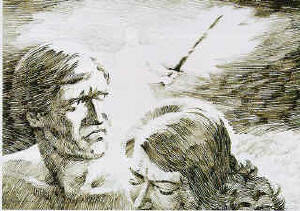 God used Abraham and his family to play an important role in the plan of salvation for the human race. 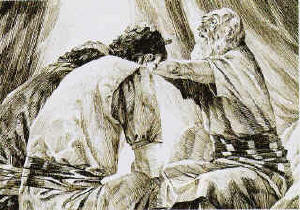 The story continues with the experiences of Abraham’s son Isaac, and then of Isaac’s son Jacob. God changed Jacob’s name to Israel (Genesis 35:10). Israel had 12 sons; these sons and their descendants were known as “the children of Israel” or “the twelve tribes of Israel.” The remaining chapters of Genesis describe how famine led the children of Israel to move to Egypt. The stage is set for the second book of the Bible. For some time after Joseph’s death, the Israelites lived among the Egyptians. They prospered and grew until a later Pharaoh began to see them as a security risk and enslaved them (Exodus 1:8-11). God saw Israel’s sufferings and graciously intervened to bring them out of Egypt as his people, to give them the land he had promised to their forefather, Abraham. Leaving Egypt and slavery behind them, the Israelites arrived at Mt. Sinai, where God made an agreement (or “covenant”) with Israel. The Ten Commandments were the heart of this covenant. If Israel would obey God, they would be his people (Exodus 19:5-6) and become an example for other nations. But if they chose to disobey, they would forfeit God’s blessings. God had rescued them from slavery and given them a new life as a nation. Do you notice some parallels between this story and that of Adam and Eve? God gave Israel blessings and then a choice: Trust God and everything will go well. Disobey and negative consequences are inevitable. The third book of Moses, Leviticus, records laws and statutes that would regulate life and worship in the Promised Land. God was teaching these ancient people that sin has serious consequences, but that it can be forgiven. Leviticus not only has laws about the ceremonial rituals in the temple, it also has laws about how the Israelites were to live in peace and righteousness with one another. Social responsibilities and worship were woven together. The name of this book is derived from a census in which Moses numbered the tribes as the journey began. It is as much a story of Israel’s failures as it is their successes. Even with continual evidence of God’s support, the children of Israel lacked faith. Time and again on the journey through the wilderness, they complained. Some even threatened to return to Egypt. The Bible is remarkably honest about Israel’s history. In other nations, patriotic epics usually glorify a people’s strengths, while minimizing their failures and weaknesses. Not so the Bible. It is relentlessly realistic about the chosen people’s lack of trust and confidence in their God. After a year or so of wandering, Israel arrived on the frontier of the Promised Land. 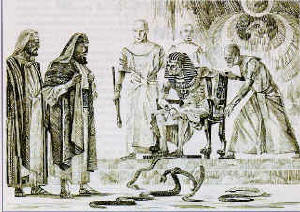 Moses sent scouts to survey the territory, but after 40 days most brought back a negative report. Most of the spies did not have faith in God, and they encouraged the people to return to Egypt. This was an important lesson for Israel. God had promised he would guide Israel to success. But Israel had to learn to trust him. But because of Israel’s lack of faith, God said that Israel would have to spend 40 years wandering before they would enter the Promised Land. The people who complained would not receive the land. The name of this last of the five books often referred to as the books of Moses comes from a Greek word meaning “second law.” The law was given again. Just before the Israelites entered the land, the aged Moses reminded them of their covenant with God. He rehearsed their prolonged lack of faith and explained again why they wandered in the desert for 40 years. Moses carefully rehearsed the laws and statutes that were to undergird the new society. He encouraged the Israelites to remain faithful to God so that their new lives in the Promised Land would be successful (Deuteronomy 30:19). At the age of 120, Moses died (Deuteronomy 34:5, 9). Before Moses’ death, God guided him to appoint Joshua as his successor. Some laws in the Old Testament may at first seem rather old-fashioned. But look again. Many of them confront the same issues that plague society today: crime, corruption, poverty, greed and even the destruction of the environment. Here are timeless, logical, commonsense principles that would help any people at any time build a fair and just society.